Bentley designs Mulsanne to cater to its traditional customers. 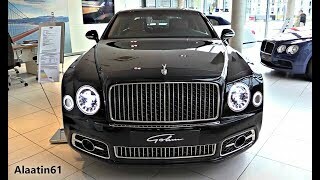 The Mulsanne incorporates all that Bentley has to offer in terms of luxury and performance, and the interior of the 2013 Mulsanne takes it to an all-new height. 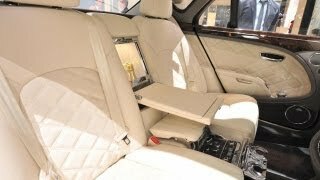 Now, all of us know that people who normally ride in Bentley cars are mostly people who occupy powerful positions in various fields. They form the bulk of the Bentley customers and Bentley is always trying to evolve itself to suit their needs in a better and efficient manner. The Executive Interior Concept was specifically designed for those who stay ‘plugged-in’ even when they are travelling. 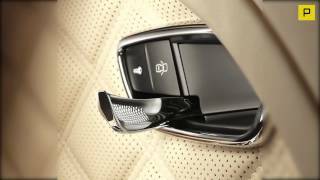 After the idea received an overwhelming response from Bentley lovers, the company decided to give it shape and now the 2013 Mulsanne will boast of this luxurious and rather tech-savvy interior. 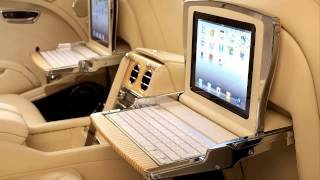 The 2013 Bentley Mulsanne Executive Interior will be offered to the customers in two different specifications – theater and iPad. The theater specification is for those who do not have to think of work while travelling from place A to B. In this option the customers will get a rear cabin fitted with high-definition LED lights. The term ‘theater’ comes from the 15.6-inch central screen and the two 8-inch screens that have been fitted to the back of the headrests of the front seats. An Apple Mac computer has been installed in the trunk, which uses the 15.6-inch screen as its display. Apart from that, the theater option also includes two USB port options which would help the user upload music and video files to the system, which can then be controlled via an iPod Touch already installed with a customized Bentley app. It also consists of Crystal champagne flutes and in-car refrigerators. In the iPad specification one will have two iPads with separate keypads installed in the back of the front seats and the picnic trays. They can be deployed just by pushing a button. It can be used to do all kind of stuffs that people normally do with their iPads. (Crewe, 1 March2012) Bentley’s advanced multimedia Mulsanne Executive Interior Concept, first showcased at the 2011 Frankfurt Show, is now moving from the design studio to the commissioning suite with the introduction of Theatre and iPad Specifications offering state‑of‑the‑art multimedia connectivity on the move. “The original Mulsanne multimedia concept was previewed at several special customer events across the globe and the reaction was immensely encouraging. Bentley has now created two bespoke Specifications, Theatre and iPad, and we’re confident they will meet the expectations of customers needing a business-focussed environment or simply a relaxing space where films, music, television and the internet can be enjoyed,” comments AlasdairStewart, Bentley’s Member of the Board for Sales and Marketing. Both the Theatre and iPad Specifications are seamlessly integrated into the Mulsanne’s sumptuous and supremely comfortable cabin, which takes Bentley’s craftsmen and women over 170hours to create. When not required, features like the drop-down screen or picnic tables retract and are stowed both quickly and discretely. Business users can take full advantage of the powerful processing capability and connectivity of the boot-mounted AppleMac computer which is selectable for display via the HD LED screen. Twin USB ports positioned in the centre console provide easy access to the Mac to upload films, music and data or documents for use either in the cabin or once the journey ends. The opportunity to unwind in style is also catered forwith an exquisitely detailed, Bentley‑designed, luxury bottle cooler with space for twofull-size Champagne bottles in a canted position, allowing opened bottles to be put back in the cooler. With one touch of a button, the frosted glass door quietly slides open to reveal threehand‑blown and hand-cut lead crystal champagne flutes, displayed beautifully by the white LED accent lighting. The flutes are exclusively created for Bentley by renowned British designer, DavidRedman of London, and echo the racing spoke design of the Mulsanne’s 21” 5-spoke Sports alloy wheel. The flutes can be placed in the bespoke-design bright chrome holders that deploy from the centre seat cushion. These also adapt to work as normal cup holders when required. The bottle cooler and fluteholders are discreetly concealed when not in use and the elegant design of the cooling system means that no boot space is compromised. And seen on a Bentley for the first time, a distinctive Yachting-style veneer of either DarkWenge with a Maple Pinstripe or Maple using the Dark Wenge as the pinstripe motif. Both of these Yachting veneers are available in a Satin or Gloss Lacquer finish. Reflecting the technical character of the Executive Interior Mulsanne the car can be specified with unique 21”multi-spoke wheels, each cut from a solid, forged aluminium billet by computer-controlled lathes and milling machines. Each billet initially weighs 85kg, and, like a sculpture emerging from a block of marble, is transformed in around threehours into a light-weight wheel weighing 13.4kg. The wheels are then individually immersed in small ceramic pebbles and agitated for many hours to produce the mirror-polish finish. Bentley Motors is the third largest R&D investor in the UK's automotive sector and the 18th largest nationally. The company employs almost 4,000people in Crewe which is home to all its operations including design, R&D, engineering and production. The combination of fine craftsmanship, using skills that have been handed down through generations, alongside engineering expertise and cutting-edge technology is unique to UK luxury vehicle manufacturers such as Bentley. It is also an example of high-value British manufacturing at its best. Bentley exports over £500m worth of goods every year to established markets like the US, as well as emerging markets such as China and South America. Bentley’s global sales for 2011 increased by 37% with 7,003cars delivered. This growth was led by the Chinese region (1839cars sold) with mainland China (excl. Hong Kong and Taiwan) up 104.17% (1664cars). However, the Americas remains the biggest market for Bentley with 2,021 cars delivered (up 32%) in 2011. All major markets were up with Europe up by over a half, due mainly to high demand in Germany (up by nearly 90%). The UK market proved to be more challenging, but still saw an increase of over five per cent. The surge in sales was led by demand for the new ContinentalGT. Over one third of all Bentley sales in 2011 were GTs with 2404delivered. December 2011 was Bentley’s best month since the recession and the second highest ever, boosted by the first deliveries of the new soft-top ContinentalGTC. We have ambitious but realistic plans to continue this growth in 2012.